As a busy mom, I often don’t have a lot of time to put together dinner. I want dinner to be ready in under 30 minutes! 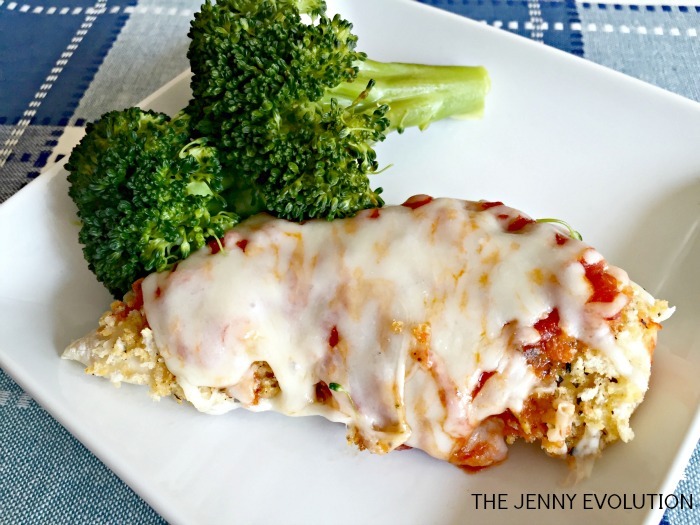 This Chicken Mozzarella recipe was such a hit with the entire family it has become a regular staple on the dinner menu! My husband and I love having chicken parmesan, but the cheese had a little too much bite for my kids when they toddlers. So we turned this dish to have a more mild cheese – mozzarella! Try it out with your own family… it’s going to become a favorite weekday dinner. Not only is this recipe a favorite weekday dinner, I’ve even served it for friends… yes… it is that popular! For this recipe, you need some basic ingredients, all of which can be put together in under 5 minutes. Step 1: Preheat your oven to 400 degrees F.
Step 2: Line a baking sheet with aluminum foil. Trust me. This will make the cleaning process SO much easier. 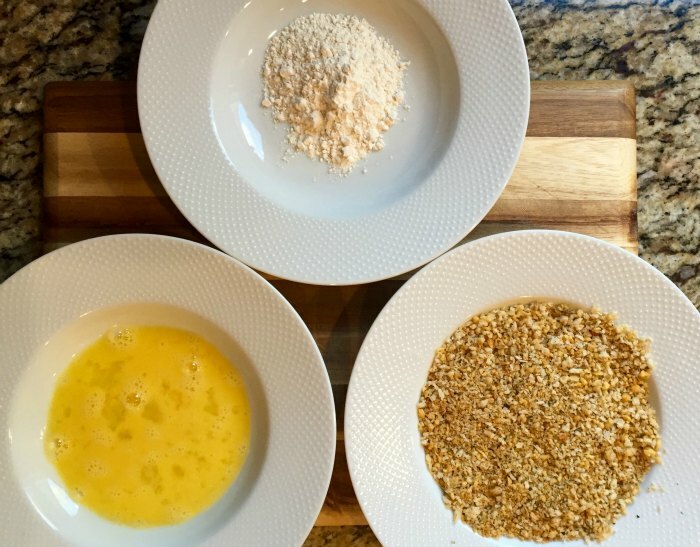 Step 3: On three separate plates or bowls, add your dry ingredients and eggs: 2-4 Tablespoons flour, 2 Eggs (beaten) and panko Crumbs. Step 4: Dip and cover each piece of chicken into the flour first, then the eggs and then the panko. Place each piece onto your baking sheet. Note: You can use either boneless chicken breasts or chicken tenderloins. It’s completely up to you. I choose whichever I feel like having that night or are on sale. For this post, I used chicken tenderloins. Also, it doesn’t matter how many pounds of chicken you purchase. What does matter, however, is that you can fit your chicken onto the baking sheet with a little bit of room between each piece for even and thorough cooking. Step 5: Bake in the oven for 20 minutes. Step 6: When your timer goes off, do not turn off the oven! Remove the chicken from the oven. Using a large serving spoon, spoon pasta sauce onto each piece of chicken. It shouldn’t be a thick amount, just whatever looks good. Step 7: Generously sprinkle Kraft Shredded Low-Moisture, Part Skim Mozzarella Cheese over each piece of chicken. Step 8: Bake in the oven for an additional 5 minutes, heating the sauce and perfectly melting the Kraft Mozzarella Cheese. 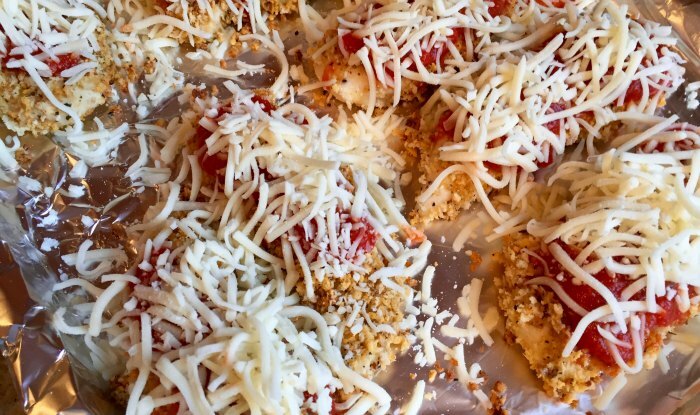 This Chicken Mozzarella Recipe is ready in 30 minutes and is such a hit with the family it's a regular staple on our dinner menu! Line a baking sheet with aluminum foil. Trust me. This will make the cleaning process SO much easier. On three separate plates or bowls, add your dry ingredients: 2-4 Tablespoons flour, 2 Eggs (beaten) and panko Crumbs. Dip and cover each piece of chicken into the flour first, then the eggs and then the panko. Place each piece onto your baking sheet. 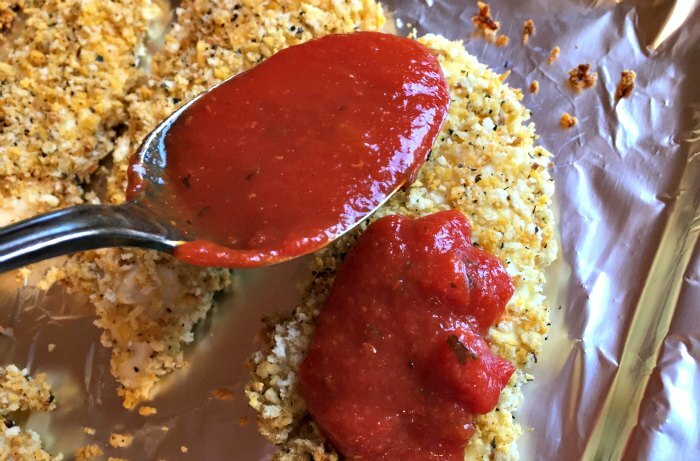 Using a large serving spoon, spoon pasta sauce onto each piece of chicken. It shouldn't be a thick amount, just whatever looks good. Generously sprinkle Kraft Shredded Low-Moisture, Part Skim Mozzarella Cheese over each piece of chicken. Bake in the oven for an additional 5 minutes, heating the sauce and perfectly melting the Kraft Mozzarella Cheese. You can use either boneless chicken breasts or chicken tenderloins. It's completely up to you. I choose whichever I feel like having that night or are on sale. For this post, I used chicken tenderloins. Also, it doesn't matter how many pounds of chicken you purchase. What does matter, however, is that you can fit your chicken onto the baking sheet with a little bit of room between each piece for even and thorough cooking. People use cornstarch all the time for coating chicken, so I don’t know why it wouldn’t work here. But I do know when you fry with cornstarch it makes the chicken that much more crunchy. Not sure what it would do in the oven. So easy!! I love it! Thanks for sharing on the What’s for Dinner link up. Will have to put this on my list of recipes to try. Thanks for sharing at Over the Moon. This can easily fit into my low carb plan, thanks for sharing! Great recipe! I’ve been making something just like this for years! Thanks for sharing at Dishing It & Digging It! Looking forward to seeing more of your creativity! Your Chicken Mozzarella looks delicious we will love it! Hope you are having a great week and thanks so much for sharing your awesome post with us at Full Plate Thursday. We look forward to seeing you again real soon! 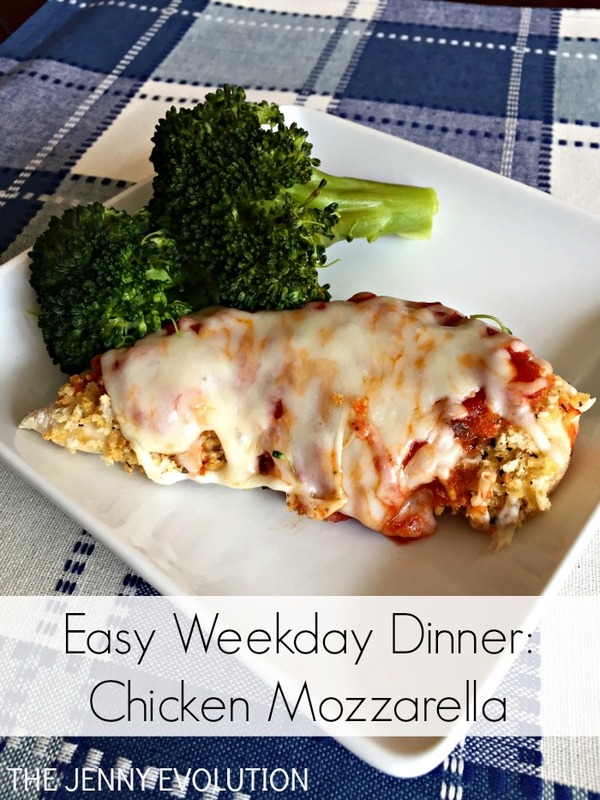 Simple and delicious… I just love quick weeknight meals like this after we’ve had a busy day of school, errands, etc. Thanks for sharing at Funtastic Friday! 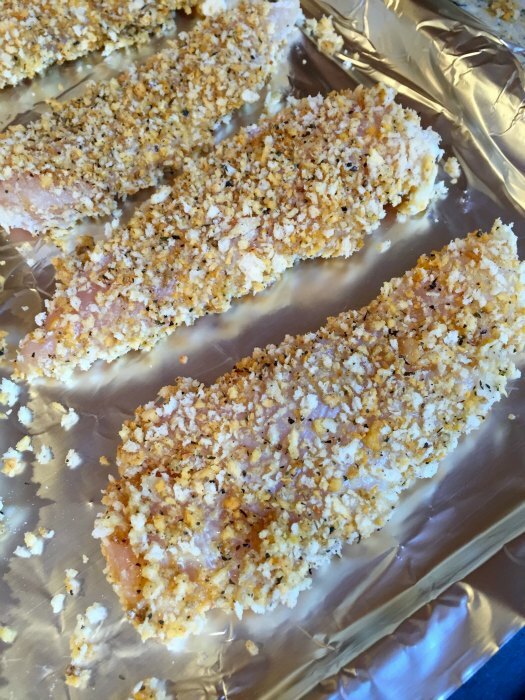 Panko crumbs? I never would have guessed it. This looks delicious and totally doable on a weekday. Thanks for the inspiration.